Any wallet where you have access to your own private keys would mean you'd be able to spend on both blockchains if there really is a fork. I looked more into the ethereum fork and it turns out that even some places like coinbase where your coins aren't stored in a wallet where you control the private key and didn't support "ethereum classic" still allowed people who had ethereum deposited with them to withdraw the forked currency for several months after the split (although there is no guarantee that they'd do that again). for that example, wouldn't coinbase have to broadcast the transaction on both chains then? did they do that in an unofficial way? either way, yeah it seems a good idea to make sure everything's kept at a privately-controlled wallet for the time being. i think there will definitely be a fork (and there probably always should be for big protocol upgrades for "backup"), but who knows how much support it'll get. What should I expect if another digital currency supported by Coinbase experiences a future hard fork? The industry is evolving rapidly and we expect that best practices will develop over time on how to handle hard forks. Right now we are handling each one on a case by case basis. The latest estimate I've read is something like 95% support for the upgraded protocol which would leave maybe 5% support for bitcoin cash and would mean solving the first block will take close to three hours. It'll certainly be fun to watch from the sidelines tomorrow morning though! In a somewhat suprising move, Coinbase explicitly said they would not support Bitcoin cash. Naturally this announcement was followed by mass withdrawal and the all-too-predictable delays. "Customers who wish to access both bitcoin (BTC) and bitcoin cash (BCC) need to withdraw bitcoin stored on Coinbase before 11.59 pm PT July 31, 2017. If you do not wish to access bitcoin cash (BCC) then no action is required." I had a spare SSD laying around. I'm not counting the $19 that I spent on the Kill A Watt Electricity Usage Monitor that is in the photo or the tools and parts that I needed to run Ethernet to the garage. I'm running Ubuntu 16.04 and Calymore's dual miner 9.7. I'm getting ~122Mh/s at Ethereum while simultaneously getting ~3675Mh/s at Sia. I'm drawing ~1320W which seems on the ragged edge of the power supply that I chose. Dual mining Sia increased power consumption by about 30% and decreases Ethereum production by ~3%. I pay $0.08/kWh. In a somewhat suprising move, Coinbase explicitly said they would not support Bitcoin cash. I'm curious because I don't have any experience mining alt-coins with GPUs, but I do mine Bitcoin. What is your profitibility in mining alt-coins with GPUs? Your upfront costs seem pretty hefty for such minimal mining power (MH/s). How does that hashrate translate with alt-coin profitibility taking into account your upfront cost of $1800? I have a 7.5TH/s miner that draws 1150W. At Bitcoin's current difficulty and price, it brings in about $7 or .0025 BTC each day. My electricity costs are about $100 a month ($.12/KWh) and revenue is at about $210 a month. The miner cost me about $1100 total (miner, PSU, shipping). I figure I will run this unit for 2 years even if it is barely keeping pace with the electricity costs since I have a feeling Bitcoin will go up in price (possibly even doubling) in that time. I'm just curious as to how that stacks up against alt-coin mining. I know GPUs are out of stock like crazy, so it is clearly profitable. I'm just wondering how well that scales and how well does an investment like yours pay off? As of right now (current difficulty and price) I am mining $6.89 worth of Ethereum and $1.86 worth of Sia per day while spending $2.53 on electricity ($0.08/kWh). So, that's $6.22 per day after electricity. Obviously as prices and difficult change that can change a lot. So, I guess that's $189 after electric costs per month. I'm not sure that this is a great investment, but I max out my 401k every month with equities. To me this is a fun side project that *might* earn me some money. Obviously, I don't just want to burn $1800, but I know just how risky this is. EDIT - I hope to use the parts for 3 years. It looks like coinbase is ooching towards supporting bitcoin cash. Anyone have any thoughts on what to do with the new cash-coins? Is bitcoin cash actually getting used out there in the real world? my current thinking is as soon as I can, I will dump the bitcoin cash coins and be happy with whatever I get for them as its essentially free money. i'm going to sit on my coins on both chains for the time being. the miners could do anything and it's up to them, really. if bitcoin cash goes to 0 there's no real loss there. once the cash chain difficulty drops or if the segwit2x outlook looks shaky, miners may be incentivized to switch to the cash chain. all it takes is one larger miner to make the change to severely slow down the old chain. 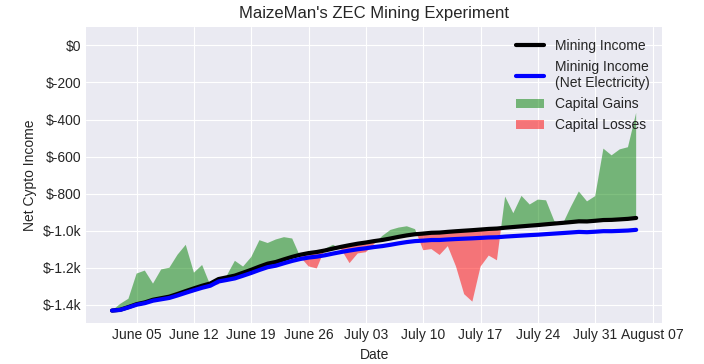 Another semi-regular semi-scheduled update from my ZEC mining experiment. Mining income continues to flatten out, although I'm still significantly ahead of the cost of electricity. I may still get bailed out by capital appreciation I'm getting by letting my ZEC mining earnings accumulate in bitcoins and zcash instead of converting them back to dollars as I go. * I'm treating all the bitcoins that were in wallets I controlled on August 1st as now existing as both BTC and BCC (and counting the sum of ZEC BTC and BCC to calculate capital gains) and any new earnings since then as only BTC. Like PDXT I knew the risks going in and see this as a fun side project and it continues to be fascinating. *This is really cheating when it comes to deciding whether my decision to build a mining rig payed off, because it's an entirely different activity from mining, and I could have just put the dollars I spent on my mining hardware directly into BTC and ZEC and had the same effect if not more. A year from now [Bitcoin Cash] could be worth $0 or $5000 per coin. It has all the same characteristics of bitcoin with bigger blocks, and more exchanges are starting to support it. ... From where I stand though I don't see how one can be a believer in bitcoin and not think the same price increases can happen for bitcoin cash. However, you can make that exact same statements for bitcoin, bitcoin cash, and at least a dozen other altcoins. From what I see bitcoin cash is like getting in on the ground floor of bitcoin. Why not hold or add to your bitcoin cash position? A year from now it could be worth $0 or $5000 per coin. It has all the same characteristics of bitcoin with bigger blocks, and more exchanges are starting to support it. I'm watching from the sidelines, not willing to speculate with my own cash in any crypto. From where I stand though I don't see how one can be a believer in bitcoin and not think the same price increases can happen for bitcoin cash. There is hardly any logic or past info which we can reference. Maybe one ETH and ETC. ETH which is the new-but-official coin went sky-high while the old-and-unofficial grew steadily(slow by crypto standard). I stopped mining Eth + SC and have been mining Signatum (SIGT). I've mined $25 worth of SIGT, 6x 1060's, since yesterday afternoon and I was in a bad pool for about half the time. The price has skyrocketed but so has the difficulty. If the price holds, it could be a very profitable coin. How many watts is your rig running on? AMD or Nvidia? This new rig, x8 1060 6gb is running just under 800 watts which is pretty amazing really. All cards have memory overclocked and power turned down to 60% using MSI afterburner. Mix of 1060 6gb (stupid limits, have to mix and match brands and sizes). The best thing about building rigs, I am getting pretty good with aluminum which is a really useful skill to have I am finding out. It is so strong, light, looks cool, and is very cheap if you buy the right size. Nice, watts seems a little high to me. My 6x 1060's use 480 watts on 60% power. Perhaps because mine are 3gb, idk. Yours are better and you can dual mine SC more efficiently than me. i was dual mining Eth + SC with 141 Eth and 180 SC hash. The SC took a big hit on the 3gb gpus. You should definitely be mining Sigt right now. You will double profits. If you dont want to hodle, send the coins to your Cryptopia wallet and sell them throughout the day for Eth/SC. You will end up with twice as much per day. Use Pav's ccminer for good results. If you are a risk-taker, or savy about virus', download sp's modified ccminer from a reliable source (some leaked copies have trojans). Thats the best Sigt miner but you either have to pay or be careful about who you download it from. Just want to add Sigt uses a new Skunk algo. 1060's get 18-19 mh/s on it. I don't quite get that, I get closer to 16.5mh/s. Whattomine shows you will make about $32 per day with your rig but I found its not very accurate with this algo. You can expect just a little over half what it reports. The problem is the pools don't actually report what the ccminer does. For instance, my 101 mh/s on my ccminer is stable but Suprnova fluctuates between 40-145mh/s. Its still the best option at the moment so get it on it while you can. Zcash, Monero, and Dash (and a handful of other, similar coins) are designed as mediums of exchange but offer a privacy-oriented transaction mechanism that makes it nearly impossible to identify a user by their transaction history (which is what Bitcoin, Litecoin, and Ethereum currently allow). I see government regulation as a huge hurdle for these privacy-oriented coins, so I plan on watching from the sidelines for the time being, and learning more about them as the digital currency market grows legs. Now that the digital currency market has ballooned to $100 billion+ in total capitalization, there seems to be a coin for everything and everybody. Some of these have very interesting use cases that may or may not disrupt entire industries (Ripple, Sia, etc..). But since we are investors here on the Mr. Money Mustache forum, we need to be able to separate the signal from the noise. That is why, in my opinion, it really only makes sense to buy Bitcoin, since you are looking to put your money into an asset that will consistently gain value over time. Ethereum is also worth considering as the demand for its applications outpaces the supply of Ether tokens. However, as other users have mentioned, it does not have a clear monetary policy. I put together this little document for those who are interested in getting started with digital currencies but aren't sure where to start. Comments are enabled! Full disclosure: I mine Ethereum in the Ethermine pool (12x 1060 GTX 6GB @ ~238 MH/s) and buy Bitcoin during price drops (I transfer $500 or so per month to GDAX where it sits until I decide to buy in). As a hobbyist with tech background I cannot agree with you more. There are a lot of noises and it's hard to figure out which is which as a hobbyist. The best bet is to stick with the main coins first: BTC, LTC, ETH and start dabbling: buy, read, sell, read, read, read and repeat. For new people, coinbase has an Auto invest feature you can setup weekly/monthly in the 3 major coins. It is by far the easiest way to get started. Just sign up for their website, link a checking account, and turn on auto invest for the coin(s) you want. No need to learn all this complex mining if you don't want to. Until there is an official ETF, this is a good start. So this thread seems oddly quiet lately, especially with a crazy run up of Bitcoin and other crypto values. So, anyone's guess how high this is going to go? Who's made shitloads of money? I haven't made much as I only have a very small portfolio of a few coins. Yup! Things have been very good lately. I've made several times more in bitcoin the last two months than I have in my real job. I predicted that Bitcoin would hit $3500 in August and continue going up from there, so this has well blown past my predictions. I think a number of factors are at play. I believe how well Bitcoin handled the hard fork has given a lot of investors a lot more confidence in bitcoin knowing that any contention to the main chain isn't likely to be very successful. Also, Japanese adoption continues to be going bonkers. Combine that with all the worldwide uncertainty of war with North Korea and the traditional markets declining and bitcoin seems to be emerging as a very nice safe haven. The future of bitcoin looks even brighter. I do predict a somewhat downturn come November as investors get nervous again when the second phase of SegWit2X comes into play. This time miners of the main chain will actually need to upgrade software in unison as opposed to simply doing nothing avoid a chain split. But after a successful upgrade the price surge will continue up again. Please do not predict, our ability to predict dwarfs the whims and fancies of the whaler. If a whaler wakes up with epiphany and starts selling, then it's the big dump. Early holders have way too much holdings to make any technical analysis stands. Whales create noise, but not trends. I've thought about that myself with my own mining as well. With the huge gains that Bitcoin has seen over the last several months, it is hard for mining to keep up with compared to if you had simply investing the up front costs in Bitcoin itself instead of the equipment (I think that's what your getting at). However, it is hard to (or at least unfair to) calculate in the short term because in the long term mining will win out so long as you are able to mine back all the Bitcoin you spent on the equipment and then some. As long as you can mine back all the Bitcoin spent on your equipment plus a little more, then you'll be able to realize the gains you originally missed out on plus all future gains of the asset if you continue to hold. In other words, if I spent 1 bitcoin to mine one bitcoin, then there really isn't any opportunity cost involved regardless of what happened to the price of Bitcoin during the time it took to mine that 1 bitcoin. Therefore, if I spend 1 Bitcoin to mine 1.5 bitcoin, then I profit 0.5 Bitcoin regardless of what its worth is at any point in time. The only difference between the two investment options would be if the Bitcoin (or whatever crypto-currency) price plummeted while mining work is still being performed. At that point you've already made the capital investment in the equipment and your only option would be to continue to mine in hopes that the price returns or to bail and recoup some of the equipment costs by selling the hardware. Whereas if you had simply just invested the initial money in Bitcoin you could sell immediately and mitigate some of your losses right away. Does opportunity cost really work this way for mining? One can buy one BTC for x dollars or etc or bannanas or babbage coins today. At least for BTC, difficulty keeps going up and the reward steadily goes down with each Halving. So going forward one doesn't really know what one can get from mining. As a year or two go by its likely your miner may no longer be cutting edge/competitive. Maybe one can say that one must be willing to switch to a more profitable crypto currency? If you build your own rig it would take you approximately 9 months to pay off your equipment and cover electricity cost. However, if you would have built a rig about 6 months ago you would have paid it off in 3 months tops. People with $2,000 rigs were mining $800 a month a couple months ago. Its now about $300 (electricity is probably $40-$50 per month extra depending upon your rate). @OneCoolCat, those numbers have gotta be ZEC or ETH mining right? The price/difficulty of bitcoin mining doesn't change that rapidly anymore does it? @CanuckExpat, it's a good question. I'm out of town all week but would be interesting to run the numbers once I am back on my home computer. Could compare to putting the same amount of money I spent on mining equipment right into the cyptocurrency (right now I know I'd come out way behind just because bitcoin has been on a big run up in price), or into stock/bond index funds. One important question to resolve, would you say it makes more sense to only consider the potential increase/decrease in value of the investment, or the total value of the investment? The money I spent building my miner is gone (maybe I could get a couple of hundred bucks for the parts if I wanted to mess around on ebay), which my charts show me starting off more than $1,000 in the hole. For an investment in the currencies themselves (or a stock index fund) I'd still be able to get my original investment out at any time (less any capital losses). Your analysis assumes that the mining is being uses as a method of buying bitcoins (or other currencies) which lumps together two very different financial questions: whether it makes financial sense to mine BTC/ETH/ZEC/etc and whether it makes sense to hold BTC/ETH/ZEC for appreciation. I'm currently doing some of both, but it could very easily be that once we're looking at this with the benefit of hindsight, one (either one) will have made financial sense and the other did not. So I'm trying to separate out the two effects as I go along. I'm not really sure I get what you're saying. The miner I have today will absolutely become obsolete some day. That doesn't mean that it won't mine me more bitcoin than I spent on it. Unless there is some drastic change in the difficulty and massive unexpected jump in the network hash rate, then I expect to make more bitcoin with my miner than I spent on it. I paid for the miner with bitcoin, so disregarding the price of bitcoin at any point in time, then I will fully expect by the time my miner becomes obsolete that I will end up with more bitcoin than I spent. Determining success or failure in the end would ultimately depend solely on the value of the bitcoin that I mined at some point in the future. The big question about profitibility then becomes chiefly about what happens to the price of bitcoin. The only way to analyze success or failure is with the benefit of hindsight. Since both mining and investing success in bitcoin both depend upon the appreciation of bitcoin, then the main difference between the two is the mining difficulty during the mining period. Therefore, I'd say that the biggest difference between mining bitcoin versus investing in bitcoin is that mining bitcoin is a little more risky since if the price of bitcoin plummets to the point where mining is longer profitable, then the sunken cost of the mining equipment purchase becomes much more difficult to recoup in a market devoid of willing purchasers of obsolete mining equipment. Also, with an upfront investment purchase of bitcoin, if the price begins to plummet, once can simply sell the bitcoin and limit the downside risk. That being said, mining bitcoin also has much more upside since in general you can mine more bitcoin than was spent (say 150% of the original investment give or take with today's difficulty and an efficient miner). That means, if holding the bitcoin long and the price appreciates even modestly, the gains will outpace those that would've been realized had one just simply invested the money instead. At least this is based on my own mining experience. YMMV. The biggest variation in one's outcomes would likely be electricity costs. If electricity costs are expensive, then in an investment scenario one could invest the money that would've been spent on electricity for mining to continue purchasing bitcoin dollar cost averaging along the way. This could greatly diminish the benefit of mining over a pure investment strategy. I'm very new to this, so I apologize if this is a dumb question. I bought 8 ETH using coinbase this week. My plan is a long term hold just in case it goes crazy like BTC and its a small part of my portfolio I'm willing to risk big losses with. My question - is it safe to keep in coinbase? I'll assuming your personal cyber-security is strong here (strong passwords, two-factor authentication enabled, secure browsing habits, etc), because if you're Coinbase account is ever compromised then someone could empty your wallet and you'd lose your funds with little recourse. So assuming that isn't a concern (truthfully it should be though), then it mostly comes down to your risk appetite. The risk being how much do you trust Coinbase to continue to operate in the foreseeable future. They are one of the most reputable and largest exchanges around, so they are certainly very trust-worthy and have received tons of funding. There's also the risk that regulations in any given state could cause them to stop serving customers in those states, but usually in those cases they'll allow customers to withdraw funds until a certain deadline...but you never know. Also, the above was all in regards to whether or not your ethereum is "safe". But "safe" could also mean ensuring your digital currency follows the proper blockchain. There is always the risk of a fork with digital currencies where changes to the code could cause blocks mined under those differences to create separate chains. In this case, because your crypto-currencies is held by an exchange, you technically don't own the private key to those coins. Therefore, you're at the mercy to how the exchange determines what chain the coins you own will follow. If they make the wrong choice or don't give you an option, then that could cause you to lose the value of your investment unnecessarily. Things like this can all be mitigated simply by owning your own private keys in a wallet you own. The way I see it is Coinbase can be used similar to how you would a checking account. I keep some spending bitcoin in Coinbase each month and have a bitcoin debit card (Shift) linked to my Coinbase account that I use for spending. They make spending bitcoin directly with other merchants very easy. However, just like with a checking account, any large amount of funds that you don't see yourself spending for a long period of time, is it worth the given risks above? Especially considering that there is very little effort needed to completely mitigate that risk. That effort being to simply install some wallet software on your computer to store your bitcoin instead and then secure your wallet seed physically somewhere. So any money beyond what I see myself spending short-term I move to my personal wallet for long term safe-keeping. I know you said you purchased ethereum, but the same idea applies. TLDR: Coinbase is not a bank account for storing large sums of money. But for small funds or for spending money, then they're sufficient as long as you take the necessary cyber-security precautions. Good advice by the previous poster. I'll re-enforce by saying that one should NEVER leave substantial coins in online wallets. Way to many instances in the past of the online wallet operators taking off with the money. No clue on Ethereum but one of the safest ways to protect bitcoins is do an offline wallet on a computer never connected to the Internet. Put a strong password on that wallet and then print out the keys without a password and store the print out in a safe deposit box. That away if the off line computer gets stolen/destroyed/etc you can always recover. Also, if you kick the bucket whoever has access to your safe deposit box can recover using the print out without having to know the password. Get a hardware wallet like with one of these: https://www.ledgerwallet.com/products/ledger-nano-s or print your wallet private keys on paper but not near any cameras or anything and put in a safe or safety deposit box. Hardware and paper is probably the most secure right now. Do not keep too much money on exchanges, that is what you always hear about when you see news about bitcoin hacks. Nobody hacks the actually blockchain/coins, its the exchanges. Also there is a new bitcoin documentary on Netflix that is pretty interesting. Any sentiments on BTC v. BCH re: hash rate? A ton of overblown chatter going on, especially on Reddit, regarding BTC and BCH hashrate. Most of it isn't really even true. All kinds of crazy talk like miners are going to move over to BCH and BTC is going to come to a halt and fail. Meanwhile BTC hashrate is at an all time high. BCH will absolutely become more profitable to mine and its hashrate will increase as well, but not to the detriment of BTC. A lot of this nervous chatter is only happening because the BCH network is speeding up as the price climbs as well (driving mining profitability up), but meanwhile SegWit has yet to activate on the BTC network which will take place next week. Once that activates then the talk about BCH overtaking BTC will die down for sure. Plus, to add to all the drama, the 2X BTC1 hardfork in November has received a lot of attention for BTC the last couple days. People just need to chill out though. November is still a ways out and a lot is going to be happening with BTC until then. So no need to get ahead of ourselves and talk about the possibility of another hardfork. The truth is that a lot of money is on the line for all the stakeholders in play and when it comes to running a business, they likely won't want to be doing anything that will jeopardize the value of the currency that their business depends on. So while some businesses may be pushing the idea of another hardfork, at this point in time it is still to early to determine what will happen. In the end, after all this drama shakes out we will still have a solid BTC foundation that is resistant to any type of shake-up coming from a loud minority. This will only serve to drive the value of BTC up even further just like when BTC remained stable through the BCH hardfork. What's folks opinion on cloud mining? It's pricked my interest but seems so straightforward I'm doubting it. Given the high cost of the coins at the moment it obviously seems good but just wondering what other folks think. It seems that some company like Amazon could kill all of the other crypto-currencies in a relatively short time by coming up with their own version which is actually backed by Amazon store credit. Amazon is so valuable to me right now that I would take $500 of Amazon credit in lei of $400 hard cash if I were selling someone a used lawnmower or something. I know that Amazon already has gift cards but these are not as secure as a crypto-currency? If Amazon developed an exchange like Coinbase and established their own crypto-currency, it would just shoot to first place. It seems unlikely that cloud mining is ever going to be a way to turn an immediate profit because the folks building and maintaining the machine are generally only going to sell it to you if they figure you're paying more than they could make running it for themselves. * But there could always be exceptions, so that's a general analysis, not running the numbers on any particular scenario. It'd be interesting to compare the cost of one of these machines to buying hashrate on one of the 3rd party aggregators (like nicehash) where you can essentially rent out other people's miners on a minute by minute basis. Hopefully you're getting a much better deal by essentially committing to an indefinite contract. OTOH, cloud mining (or any kind of mining) where you don't sell the coins as you mine them is one way to speculate that the cost of bitcoins will rise in the future. If that's your goal you could also take the amount of money you were going to spend on your remote mining rig and just buy the currency with it. So embarrassingly my idea build a mining income for income seems to have been a quite poor one, while holding cryptocurrency has really paid off in the last month. Had to reset my y-axis and move the legend to the other side of the graph to make room for all the capital appreciation. So I started out with approx. ~$1,130 in leftover bitcoins and spent ~$1,430 on my mining equipment in early June. Let's leave aside the existing bitcoin holdings (which are really the only thing that pulled my portfolio into the black). If I'd spent the money for my mining gear on zcash, I'd have $1,320 (-$110 in capital capital losses, plus initial principal). Now mining continues to be profitable for my machine even net of electricity costs and may well remain so for several months (or maybe even into the winter), so it is quite possible that I'll catch up to the "just buy a buy of zcash" or "be a responsible person and sweep your excess hobby money into your stash to buy index funds." It's quite unlikely I'll catch up to "put it all on bitcoins" but if I'm being honest with myself about my state of mind in early June I was much more excited about zcash than bitcoin so the second scenario was a more likely outcome than the first. Easy with the benefit of hindsight, huh? *If I'd been selling my mining income as it came in I'd have $530 ($900 in the hole). **Includes the value of bitcoin cash in addition to bitcoin for bitcoins held in private wallets on the day of the fork. What happens if you lose or break your hardware wallet? How does one justify the environmental impact of mining? I've read that processing BTC transactions takes 1000x+ the power of processing a credit card transaction. It seems like an anti-mustachian way to make money for this reason. In the context of your (developed world) lifestyle, it's probably not real meaningful. Is it a waste of electricity? Yes. Is it worse than, say, mining gold (another hoardable "asset")? Certainly not! If it drives technology and creates some new inventions or faster processors then the energy consumption might be worth it in the long run anyway. I think you are both right, and this is a trickier question to answer than I thought. What is the best alternative.. It's easy-ish to answer in hindsight, but that's not a fair comparison. It might turn out to be different for each person depending on your goals. If your goal is to accumulate as much BTC/ETH/ZEC as possible and hold onto it indefinitely, then lifeanon makes a good point, that you will presumably "break even" at some point as long as you can mine back the cost of your hardware in that currency. It means you should measure and plot your y-axis in that currency, and the time period to break even is really a shift of the x-axis (assuming mining difficulty doesn't get prohibitively harder as you wait, I don't know enough about mining to think about this). 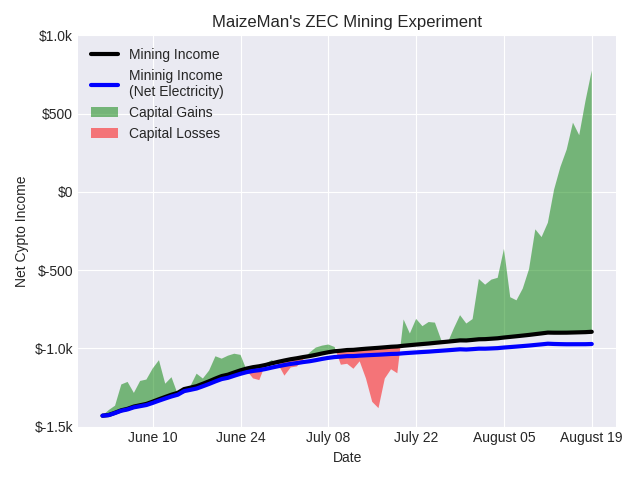 If your ultimate goal is to maximize USD (or other fiat currency) by accumulating and then selling cryptocurrency at any arbitrary point in time, which is what I think maizeman is implicitly getting at since his y-axis is in USD, then a "fair" comparison might be buying the equivalent of your mining hardware in that cryptocurrency and tracking the appreciation in USD to that arbitrary point. If you wait long enough that you would have mined it back anyways, I suppose you still break even just with much less liquidity. So I'm not sure what is the right answer. Opportunity cost is hard. Maizeman, continued thanks for the clarity of your experiments and reporting. If a company has large inhouse computing capacity that is (say) not being used to full capacity 24/7, is there any value to getting the under utilised compute capacity to mine bitcoins while otherwise idle? We also generate our own power, btw. You get a new one and put in your secret key you wrote down and put in your safe. BAM! New hardware wallet with same addresses. I don't think the ends will justify the means in this case. I think many don't understand the massive scale of power going into cryptocurrencies right now. That's why I wrote the above post. It takes 100s of people to verify a "normal" old world money transactions. If you added up the commutes, individual consumption, compute power they use to move those bits around, etc... You are most likely coming out at least even, but probably much more ahead on crypto currencies then traditional credit cards, bank transfers, western union, etc. The point of gold is a good one as well. Buy something at the store with your visa. There are a lot of people and computers behind the scenes that process that transaction, record it to ledgers, etc. Currently, bitcoin accounts for a tiny but growing piece of the worldwide currency usage. Imagine what could happen as transaction volume grows by 10x, or 100x? (Transaction volume is what consumes the power, not the price of a Bitcoin). This seems entirely possible, if not likely, given the hash rate has grown by 4x in the past year alone. No doubt the energy consumption of bitcoin is massive at the moment. The problem however is that the energy consumption of bitcoin is always measured in energy spent per transaction. That type of calculation isn't exactly the most fair to bitcoin. However, it is one of the only common metrics we have between bitcoin and the VISA network, for example. So that is what generally gets used as a comparison. The reason why it is unfair to measure energy consumption on a per transaction basis with bitcoin is because of the fact that the amount of energy consumed is the same whether there are 4,000 transactions in a block or there are 20,000. It is the work put into hashing the transaction block that consumes energy, not the input to the block that matters. That means that as the network scales, it will inevitably become more energy efficient as time goes on. Contrast that with your typical backend database solution (any non-blockchain system) and you get the opposite effect; the more the network grows the more energy it consumes. Furthermore, with SegWit being enabled, the possibility for the Lightning Network to play a role in payment transactions will allow the bitcoin network to scale dramatically while being able to do so with the equivalent compute power of a home desktop PC. That will allow way more transactions to be processed with a much lower energy footprint than today. That being said, the bitcoin blockchain would still be confirming payment channel transactions and so the network would still need to scale more from a transaction and energy perspective. I do feel in the case the ends justifies the means. Bitcoin has the opportunity to create a ton of social good in the world where power over money corrupts. Furthermore, because of bitcoin's inherent need for efficiency when it comes to mining profitability, that means that bitcoin will be a main driver toward lower cost renewable electricity (we're already seeing that). The fact that bitcoin consumes electricity means that its transition toward clean energy is destined to be, unlike say the transportation industry that will require dramatic infrastructure changes. So as we solve our world's energy problems, bitcoin will be right there adopting energy solutions that will allow the network as a whole to become more and more sustainable. Planning for power is something that is done at the earliest stages of bringing a mining operation online which isn't something you see in many industries today where power consumption is an afterthought. The biggest problem I see with bitcoin (with regards to energy consumption) is the fact that bitcoin's greatest energy demands come at a time when its energy sources will be the dirtiest in bitcoin's lifetime. TLDR: Bitcoin's inherent need for lower power consumption above all else to achieve mining profitability means that the power problem for bitcoin will ultimately solve itself in the long run. Not using a system that has potential for so much social good is short-sighted given this fact. As the world adopts electronic payment systems, a blockchain based approach is much more energy efficient than traditional systems at scaling over the long term. I would agree with all of that with the caveat that Bitcoin isn't (and probably never will be) "money" in the sense that it's widely used for transactions. The inherently deflationary design IMO ensures that it will instead be a gold-like store of value (assuming it's anything at all in the long run, it could of course be abandoned for some other crypto system). So the proper comparison, environmentally, is probably to physical gold. For what its worth, gold was used as a universal currency for centuries. The reason why we moved toward paper money was due to convenience. It's not as easy to carry around a sack of gold coins as it is a wallet with folded money. Bitcoin combines the value of gold with the convenience of electronic transactions. Whether or not you believe any deflationary currency is good for the economy is another topic of economics altogether. I believe the world is in desperate need for a non-manipulative deflationary currency. The fact that it is extremely convenient to use will help ensure its mainstream adoption.